arg!! sorry i say this everytime but ure drawings are amazing! ^_^. gawd...it's like SOOOOOOOOOOO good!!! How long did this take u? 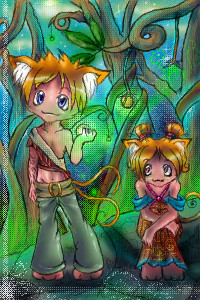 OMG...*runs away and sulks in the corner* I WANNA DRAW LIKE THAT!!!!!!!!!!!!!!!!!!!!!!!!!!!!!!!!!!!!!!!!!!!!!!!!!! This is soooooooo good. I love your art (Like always). I love the shading. Woooahh... nice jungle colors. ;D!! I love your art..the colors the shading.. everything! Its the uber coloring... If only I could see the animation. so so so so cuteness! they llok so cute i just wanna huggle 'em! Its magnificent. I love the green. Aww they're so cute. I like the composition of this piece, u did a great job on it. wow thats really awesome! its cute too! i love it!